When it comes to painting and remodeling, do-it-yourself approaches can be potentially disastrous. Hiring an experienced professional is recommended, especially for extensive projects. Choosing the right organization for the job is crucial – a great deal of time and money may be lost to inexperienced or unqualified contractors. 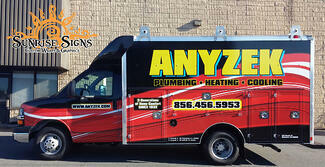 HVAC Contractor Adds Spartan Van Wraps to Their Fleet in South Jersey! When you operate a business that provides heating, cooling, and plumbing services, people expect you to be both professional and efficient – nobody wants to be without those essential luxuries any longer than they have to. In the HVAC and plumbing industry, the most successful companies will always be those with the best reputations. 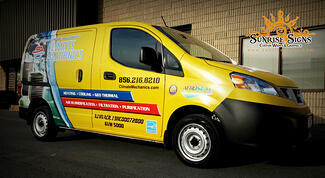 HVAC Contractor Climate Mechanics Boosts Fleet with Nissan NV200 Van Wraps! In South Jersey, the number of independent contractors is always increasing. As the economy continues to rebound, there is a growing need for electricians, plumbers, and home remodeling contractors. And, with energy prices going up and a push for greener alternatives, heating and air conditioning (HVAC) contractors are finding their industry is heating up. So, how can HVAC contractors stand out from their competition? 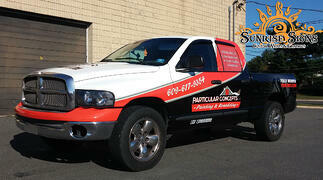 By choosing vehicle graphics and wraps! 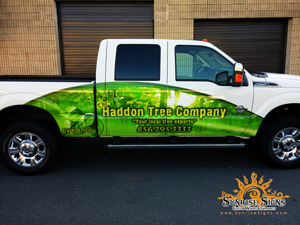 Haddon Tree Co. Enhances Ford F250 with Partial Truck Wraps in South Jersey! If you’re a regular reader of our recent projects blog, you may have already heard of Haddon Tree Company. Just a short while ago we wrapped their entire fleet of five trucks—all different makes and models of work vehicles that help them get the job done. When they came to us with a Ford F250 Super Crew with a short bed, we knew we could easily complement their existing fleet.